1. Heat 1 tbsp oil in a large frying pan. Add the sausages to the pan with the rosemary, and fry over a medium- high heat for about 10 minutes, turning frequently, until golden and piping hot. Lift the sausages out of the pan (leave the rosemary), add the remaining 1 tbsp oil, then add the onion wedges and fry on a medium heat for 12-15 minutes, until golden and soft. 2. Add the vinegar and mustard, stir to combine, then remove the rosemary and stir in the lentils until warmed through; season. Slice the sausages and add to the lentils, along with the parsley. Serve on plates with the rocket. Pre-cooked lentil pouches are a useful and nutritious storecupboard standby. 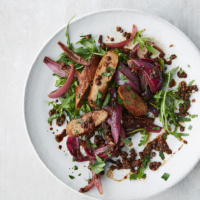 You could also try a pack of plain puy or beluga lentils in this recipe.